I’m working on a complicated story right now. It’s total fiction, with no basis in my experience, and I’ve fallen into a trap common to writers of any genre, the hamster wheel syndrome. I know better than to do this, but I’ve been editing the heck out of what I’ve already written rather than forging boldly ahead to write the story. I know where it’s going – I’m just having trouble reading the markers along the path. Yesterday I had a Skype visit with Ian Mathie, a prolific cross-genre author who pops out stories like a cat birthing a litter. Already this year Mosaique Press has released two new titles by him, making a total of six book-length volumes published over the last three years. This year’s first, Sorcerers and Orange Peels, is his fifth book-length memoir covering grippingly arcane experiences in a remote African village while working as a water engineer. The second, Chinese Take-Out, is a fictitious spy thriller based on valid history. Write with your display off to avoid distraction. Set a time limit for cranking out XXXX number of words. None of this advice addresses my specific version of the challenge. I do a lot of my writing when not at the keyboard. I think about this story constantly. What would I really do if I were in this situation? Or, How can I get them out of the campground at 4:30 a.m. without waking other campers? Or, Should they eat breakfast or fast? What are the forest service regulations about dogs in the national forest? Does El Sabio need to be on a leash? This type of question is specific to fiction. If this were memoir, I’d know the answers. 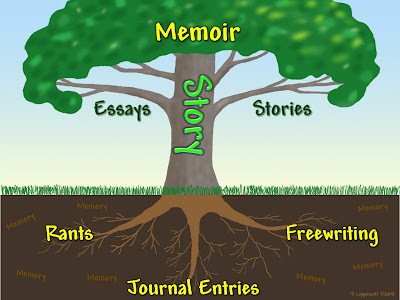 But even memoir writers have dilemmas about what to include and how to frame it. This morning I sat down to write, determined to tackle new content, but wrestling with a few changes needed in earlier material that had become clear. Determined to capture them without spending another morning rewriting, I tried a new trick, writing the edit concepts down, like story ideas. I wanted them in the story near the relevant points. I could have used Comments in Word, but I hate the clunky way Word handles comments. Instead, I inserted virtual sticky notes. These small text boxes have a pale yellow background, no border and a 2 point shadow on the bottom to make them look real – you know how sticky notes tend to bend upward just a smidge as you apply them. Right-clicking on the box border gave me the option of making this first one the text-box default for this document. To make them feel even more “real,” I created a style to make the text look hand-written. As a final touch, I changed the document layout from even 1.25 side margins to .75 and 1.75, making side margin room for these stickies. After adding a few notes in the margin and using strike-out to indicate which paragraphs need to be deleted or revised, I forged strongly ahead with the story. Who knew one little confession to a writing buddy could bear such powerful fruit? That rope he tossed lured me off the hamster wheel. Yes, I knew this stuff before, but sometimes we need a helping hand from a friend to use what we already know. Write now: Seek advice from writing friends for dealing with your particular form of writer’s block. If the advice doesn’t fit, thank them anyway, and keep looking for a solution. Before you know it, words will be gushing again. Post a comment about your experience with writers block of various sorts, or send me an email. We need to pull together to beat this writing dis-ease. I know I should keep going back everyday. Whenever I do, I find some work to do, whether it is editing writing or researching.